Diabetes in America has reached epidemic proportions with some 100 million people currently suffering from either diabetes or pre-diabetes. Fortunately, diabetes research has resulted in improvements in medication. 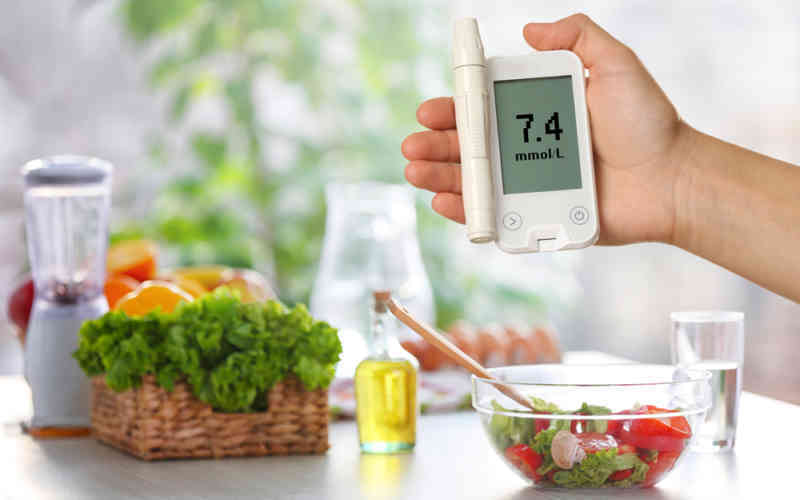 In addition, research has shown that lifestyle changes, including making better food choices, can help make living with diabetes more manageable. A healthy diet is an important component of effectively managing diabetes. Here are some tips for managing diabetes through your diet. Diabetes symptoms crop up when blood sugar levels either increase or decrease too much. These blood glucose swings can cause dizziness, nausea, fatigue and a number of other troubling symptoms. The key to keeping blood sugar levels on an even keel is to eat smaller, more frequent meals throughout the day. This will also promote vitality and energy. Refined sugars and high-carbohydrate foods can exacerbate diabetes and should be avoided. White bread, cereals, soda, desserts, chips and other processed foods such as packaged snack items can contain a surprising amount of sugar and carbohydrates. Pastas, rice and even some foods made with “sugar replacements” can sometimes cause blood sugar to skyrocket. The safest route is to avoid foods that are processed or preserved whenever possible and select whole foods such as fruits and veggies instead. Although one of the keys to managing diabetes is to reduce carbohydrate consumption, that doesn’t mean you need to eliminate carbs from your diet altogether. Eating “good” carbs, in the form of whole grain pasta, cereals and breads, is the way to go. The carbohydrates from these foods absorb slower into the bloodstream, thereby avoiding blood sugar swings. Avoid processed foods, fried foods and those that are high in fat as they can cause weight gain and other troubling symptoms. However, healthy fats, such as those derived from nuts, avocados, olives and flaxseed can be very beneficial. These healthy fats promote heart health and slow the rate of insulin absorption in the bloodstream. Experts say that high-quality protein can be very beneficial for those with diabetes. Lean proteins such as chicken, turkey and eggs are low-fat and keep you feeling fuller longer. Other good sources of lean protein include some legumes, low-fat dairy items such as low-fat yogurt and cottage cheese, and fish and shellfish. Adding more protein to your diet can reduce blood sugar swings and ensure that you don’t feel hungry between meals. At Kyffin Grove, our Diabetic Care Path Program takes a collaborative approach to diabetes care. Our specially-trained multidisciplinary team partners with both the resident and their family to provide valuable education and successfully monitor and manage their condition. Contact us to learn more about our Diabetic Care Path Program or to schedule a tour.